UK Marine offers an extensive and exhaustive range of marine surveys, safety audits and inspections for all types of vessels and floating structures. Since the last two decades we have been offering our services all over South Asia, the Middle East and the Indian Subcontinent. Our highly experienced surveyors have been offering our services to various clients including ship owners, operators and charterers, prospective buyers and investors, P&I clubs, stevedores, financial organisations, flag states, classification societies, government and other authorities. We carry out thorough condition surveys for the vessel in subject and issue a report for the condition at a particular given time. The report would detail all aspects of the vessel and its operating condition in terms of machinery, equipment and how well maintained they are. These are generally undertaken on behalf of vessel owners, charterers, insurers like P&I clubs, financial institutions and potential buyers. Following the condition survey our experts calculate and make an estimate of the commercial value of the vessel. This valuation certificate is used by owners to mortgage the vessel or by anyone concerned regarding the value of the vessel such as insurers and potential buyers. Our surveyors also recommend applicability of depreciation and the percentage and quantum of depreciation. UK Marine has extensive experience and expertise in carrying out damage surveys. Our team is available to attend on site at a short notice. Loss and damage survey would typically include, thorough inspection of vessel/cargo/equipment that has sustained damage/loss. We would also investigate the cause and circumstance under which the loss has taken place. Our detailed damage inspection report includes extent of loss, the root cause, nature of ownership and insurable interest. We also offer to quantify and determine the quantum and detail of the subject under loss. This assessment of loss is done on behalf of the insurer or insured. We carry out surveys on behalf of various P&I clubs. Since we possess expertise in damage survey as well as condition survey, UK Marine is a preferred associate to many P&I clubs around the world. We combine sea-going, classification, naval architecture and engineering experience to form a comprehensive team to carry out P&I surveys in a very proficient and efficient manner. During a vessel demolition survey, we would report the condition of the vessel pre-demolition. This would include, condition of steel and equipment, quantity of bunker onboard and complete valuation pre-demolition. We also offer to provide calculations for quantifying weight of steel inside tanks of chemical carriers and other valuable material. Our surveyors are official flag state inspectors for the following flag states: Panama, Liberia, Marshal Islands, Barbados and Antigua, Republic of Congo, Palau International Ship Registry, Venezuela Registry of Shipping, Jamaica, St. Kitts and Nevis, Dominica Maritime Registry, Union of Comoros. On behalf of flag states we carry out Annual Safety Inspections, Special and Pre-Registration Inspections on vessels calling Indian and nearby ports. UK Marine is an independent survey firm. We have been undertaking third party inspections and surveys, especially in times of dispute as a result of cargo leakage or spillage, loss or damage to ship's or shore's property, and due to any unforeseen mishap. We regularly act as third party surveyors to ascertain quantity and rate of cargo loaded and discharged. Our on-hire and off-hire condition surveys will include the estimation of consumables onboard such as bunker and water levels - ROBs. Our findings are also recorded and presented in our well-structured formal report which is issued after being Quality Assured by our team of Naval Architects and Marine Engineers. We provide all classification services on behalf of Class IBS, China Corporation Register of Shipping, Panama Maritime Documentation Services, Guardian Bureau of Shipping, Panama Marine Survey and Certification Services, Panama Bureau of Shipping. Issuance and renewal of statutory and class certification. We, on a regular basis, carry out renewal of crew accommodation certificates (CICA), ballast water management certifications (BWMC), SMC, ISSC, MLC and various other mandatory certifications. Ships using their own cranes and gears for cargo operation must have Indian Cargo Gear Register onboard with necessary Endorsements and Certificates. We issue certification and endorsement of Indian Cargo Gear equipment and lifting gear for ships calling Indian ports as required by the Dock Workers Safety Act 1990. We have the requisite infrastructure such as testing machinery, know-how and experience to offer these services to our clients. We offer this service at all Indian Ports on extremely short notice. We carry out Initial, Intermediate & Final Draft Survey to determine the quantity of cargo either loaded or discharged at any given port.Our findings are also recorded and presented in our well-structured formal report which is issued after being Quality Assured by our team of Naval Architects and Marine Engineers. 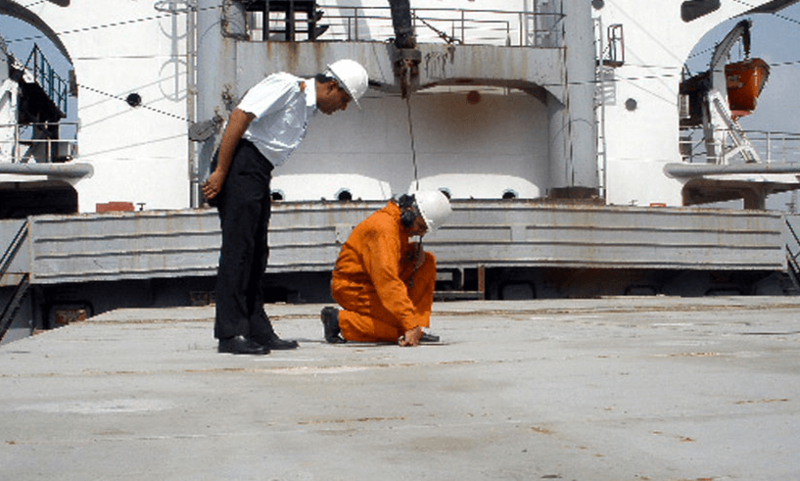 UK Marine (India) Surveyors, 114 GIDC, Sector 10A, Gandhidham – 370201, India.